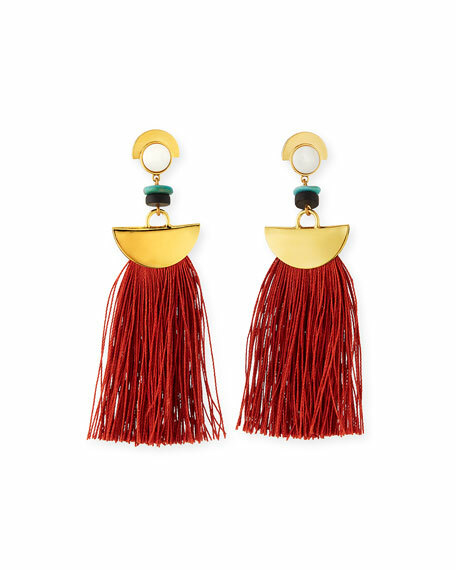 Lizzie Fortunato "Mount Sage" earrings. Green and black rondelle accents. 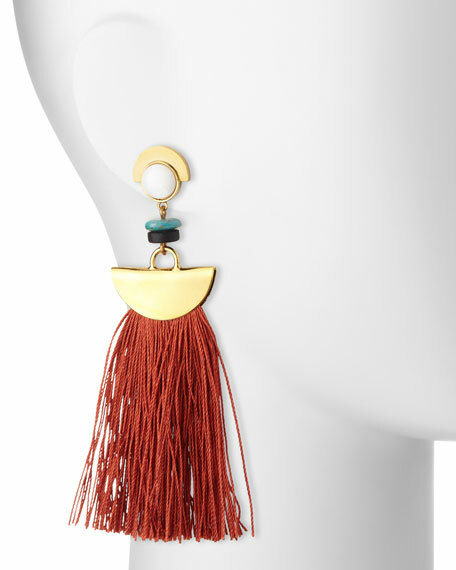 Half-moon drops with elongated tassel trim. Twin sisters Lizzie and Kathryn combined their creative talents and Wall Street background to form the Lizzie Fortunato accessory line in 2008. Handmade by skilled metalsmiths in New York, each collection spins a distinct narrative that draws inspiration from fine art, travel, and artisanal craftwork. Made with precious and reclaimed materials, bold statement pieces support the idea of "dressing to tell a story." Lizzie Fortunato designs have been featured in collaboration with designers like Matthew Williamson and Jenni Kayne on the runway, as well as the glossy pages of Vogue, Elle, and Harper's Bazaar. For in-store inquiries, use sku #1660398.